During the week of May 21, Theresa D’Amato’s fourth-grade class at West End Elementary School participated in lessons that focused on poverty and empathy while raising $273.20 for the Red Nose Day campaign to help end childhood poverty around the United States and world. Using the tools provided by the Red Nose Day campaign run by the charity Comic Relief Inc., the students watched videos and engaged in math and English Language Arts lessons that focused on the effects of childhood poverty. Students learned about how they could help others living in poverty in the United States and overseas and as a result, raised money for children in need by speaking to their family members about the cause and asking for donations. Many students even donated their own money which went straight to the Red Nose Day campaign through a local Walgreens store. On Red Nose Day on May 24, the students dressed in red and wore their red noses proudly. 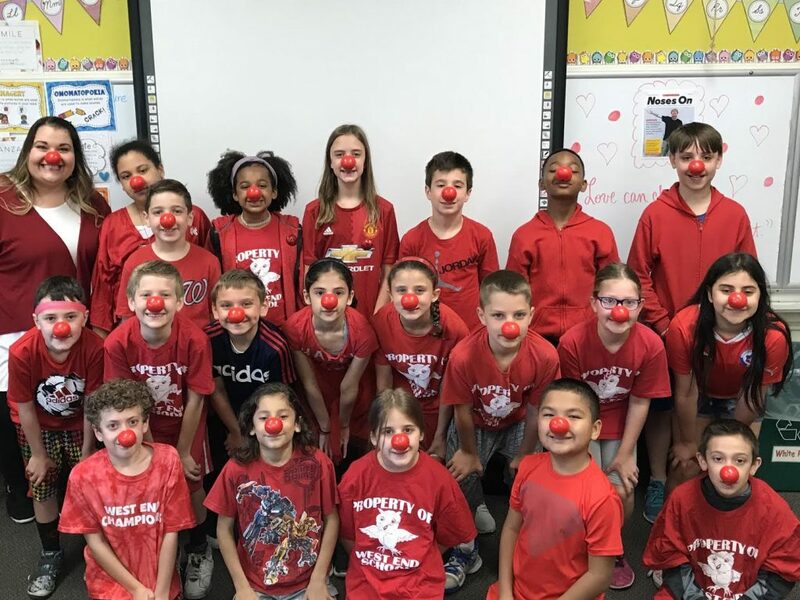 Photo Caption: West End Elementary School fourth-graders in Theresa D’Amato’s class wore their red noses on Red Nose Day and raised $273.20 for the campaign which aims to help end childhood poverty.